Johnny Cash was born February 26, 1932, in Kingsland, Arkansas, J.R. Cash was one of six children belonging to Ray and Carrie Rivers Cash. When John was three years old, his father took advantage of a new Rooosevelt farm program and moved his young family to Dyess Colony in northeast Arkansas. There the Cash family farmed 20 acres of cotton and other seasonal crops, John worked alongside his parents and siblings in the fields. Music was an integral part of everyday life in the Cash household. John soaked up a variety of musical influences ranging from his mothers folk songs from the fields and the nearby railroads yards. He absorbed these like a sponge absorbs water. In later years Cash would draw from his in Arkansas for inspiration "Pickin Time" "Five Feet High And Rising"and "Look At Them Beans" are all reflections on Cashs early life. Country great Johnny Cash and Bluegrass Pioneer Ralph Stanley Received "Living Legend" Medals From The Library Of Congress In Washington, D.C. Ceremony April 23, 2000 Stanley 73, And His Band, The Clinch Mountain Boys, Performed Later That Same Day At The National Birthday Party And Concert On The East Lawn Of The Capitol Building . Other Medal Recipients Included Colin Powell, Harry Belafonte, Hank Aaron , Tony Bennett B.B. King And Barbara Streisand. 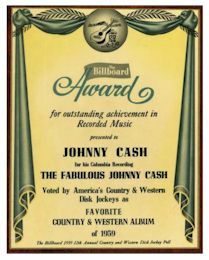 In 1980 at the age of 48 Johnny Cash became the youngest living inductee into the Country Music Hall Of Fame. The Rock and Roll Hall Of Fame bestowed it's honor on him in 1995 thus making him one of a handful of country artist in both organizations. 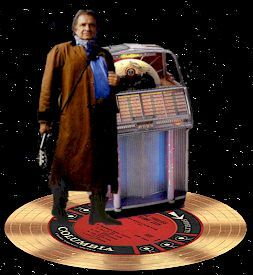 One December 2, 1989 Johnny Cash was awarded a Lifetime Achievement Award From The National Academy of Songwriters. 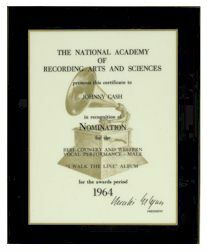 Johnny Cash will join Brian Wilson and songwriter Jeff Barry on December 2 1998 in Los Angeles to receive Lifetime Achievement Awards from the National Academy of Songwriters. The National Academy of Songwriters is a nonprofit charitable organization which educates songwriters through various seminars, workshops and showcases. Audie Murphy was the most decorated American soldier in history, receiving every decoration for valor America can give, as well as 5 decorations from France and Belgium. He now stands as an icon of patriotism and the American spirit. 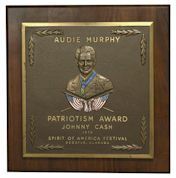 This award is given at the annual 4th of July Spirit of America Festival to an "outstanding American patriot or an outstanding group of individuals who most exemplify the true ‘Spirit of America.’ " Johnny's entire career was peppered with songs about the American experience, and his own patriotism was never hidden. In 1972 he released the intensely patriotic America. 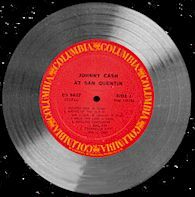 With other albums such as Songs of Our Soil (1959), From Sea to Shining Sea (1968) and Ragged Old Flag (1974), Johnny Cash always remained grounded in his American roots, striving to unmask and celebrate his country's history. Now Use Google To Search This Site!!! NOTE: This Web site is not intended to break any copyright laws. 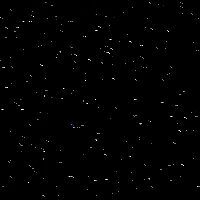 Please E-Mail Me if there is any problems with anything on this site.